My trip to Cancun was incredibly spontaneous. I was originally planning on going on a ski trip with my dad to Colorado. However, when I looked at the airfare it was about $800 roundtrip. Searching Kayak, I discovered that a roundtrip flight to Cancun leaving on Monday and returning on Saturday (no other combinations) cost about 2/5 of that. I invited my friend Jacki, who volunteers with me at the homeless shelter in Venice. So on Friday we booked our trip and on Monday we were flying to Mexico! Arriving in Cancun on direct flight around 4pm, we got on a very nice public bus to downtown Cancun. In fact, this was probably the nicest bus I’ve ever been on. This bus service goes across all of Mexico, which makes it very easy to backpack here. 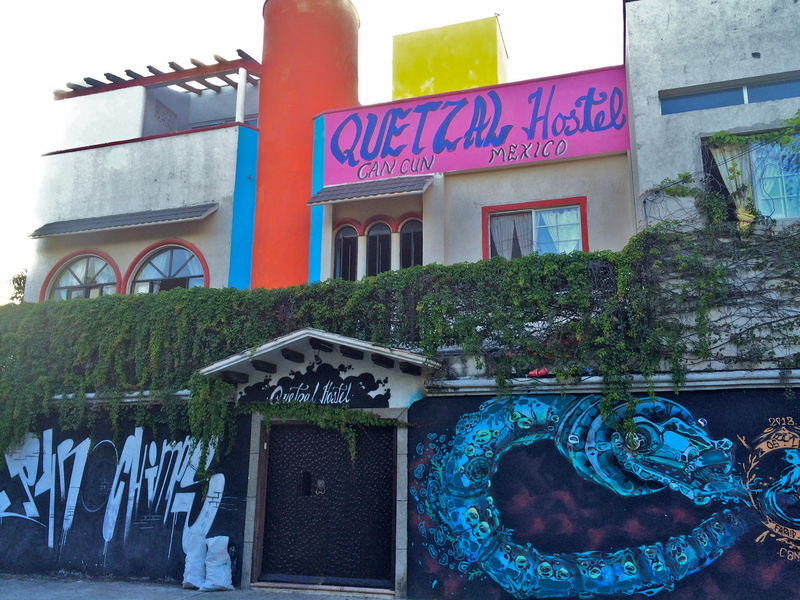 From the ‘Centro’ bus station, we walked 5 minutes to the Quetzal Hostel, a self-described party/drinking hostel. 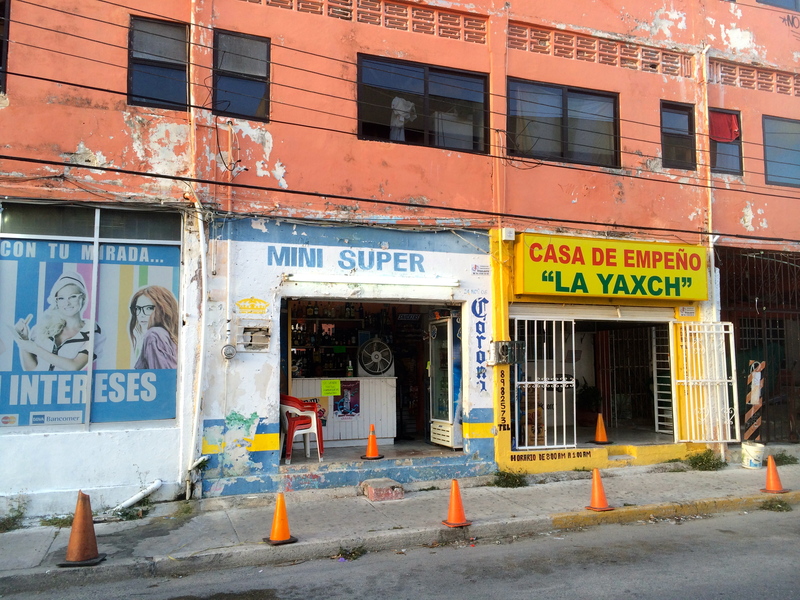 Cancun itself looked like a mix between a developed and developing country. The roads were unbelievably nice and there were lots of American chain stores. However, many of the buildings were built with cheap looking concrete, but were still well kept. Really not much to see. After checking into the hostel, I was greeted by an Australian employee of the hostel. She asked me if I wanted a drink and then asked me if I wanted to play beer pong. After she stacked up the cups and explained the rules, I then realized how the hostel makes all its money: alcohol sales! Instead of normal beer pong, the hostel plays stack cup where the cups are stacked like a Mayan pyramid. If a top cup falls into another cup you have to drink them both which makes the game go much faster which causes people to drink more. Additionally if you lose, you have to buy another drink and do a beer bong. I played with a Canadian Air Force pilot against the hostel workers. Of course, we got crushed. The Australian girl then asked me if I wanted to go out. For the price of *only* $75 US, I could get transportation to the club and an open bar. That seemed unbelievably pricey even by American standards. I don’t think I’ve ever spend $75 in a night out. The Australian girl was pushing me hard to go out (I’m sure she earns a commission) but I wouldn’t budge because we were going to Chichen Itza the next day and going out wouldn’t be good before seeing the ruins. Most of the hostel was going out that night which apparently was pretty rare. We’re definitely going to go out eventually but this wasn’t the right night. The hostel had some very funny drinking rules. If you said the number “10” you had to do 10 push-ups. If you said “mine” you have to drink a beer. If you said “tired” or “hungover” you have to drink a tequila shot. Finally if you were drinking with your right hand and someone says “buffalo” you have to “skull” your drink and buy another one. Around 7, they served dinner (included in the price of the hostel). It included a tequila shot. The Australian girl made everyone stand on the chairs and shake their butts. Then she played the song “Tequila” and we all downed the shots at the appropriate time. I’m willing to bet that there are at least 500 hotels/hostels/bars around Mexico that do this stereotypical tradition. There were no pictures from the night, but here’s a picture from a nearby street taken on the way to the hostel. The hostelers here were a big mix of people. Some people were here just to party for the week- one guy flew all the way from France just for the week. This party crowd was mostly Canadians because it happened to be Canadian Spring Break. Then there were the long-term backpackers going through Central America or around Mexico. This included a lot of Australians and Europeans. We were the only Americans in the hostel. Jacki and I ended up talking to this Australian couple, who just got back from Cuba. They said it was definitely worth going to, but speaking Spanish was a big plus. They also said that change in Cuba will be a lot slower than most Americans think. So there’s no huge rush to go there to experience the “real Cuba”. We ended up chatting until about 1am before going to bed. Around 5:30am some French guys walked back into the hostel after going out and started taking loudly and playing music in the dorm. Nobody had the heart to tell them to shut up but after like 10 minutes they fell asleep. So goes the hostel life. We woke up around 7:30 but forgot that it was actually 8:30 because of the time zone. Cancun and the entire state of Quintana Roo changed to Eastern time zone a few weeks ago to add sunlight to the end of the day. Most of the rest of Mexico is on Central time zone. 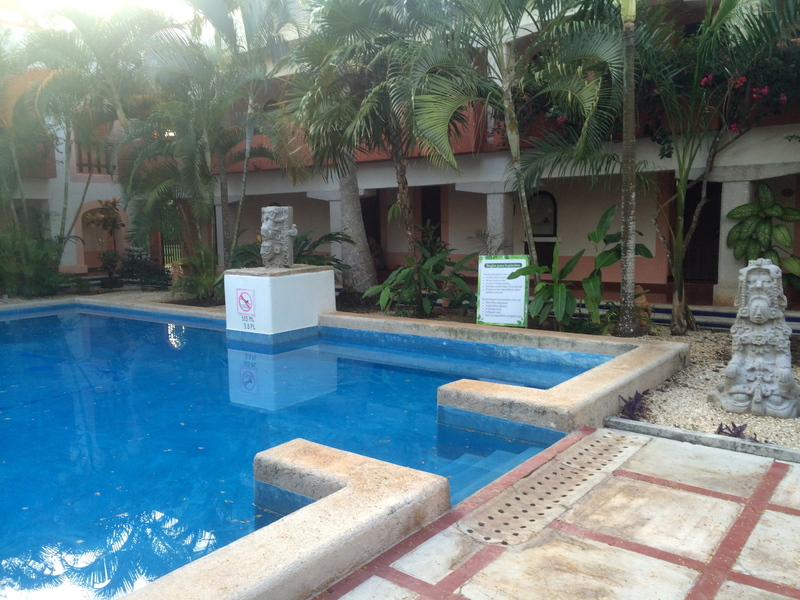 We ate breakfast quickly before heading to the bus station to catch the bus to Chichen Itza. The bus trip took about 3 ½ hours and stopped in a lot of smaller towns. About 2 hours in we crossed the border into the state of Yucatan, officially my 3rd Mexican state. 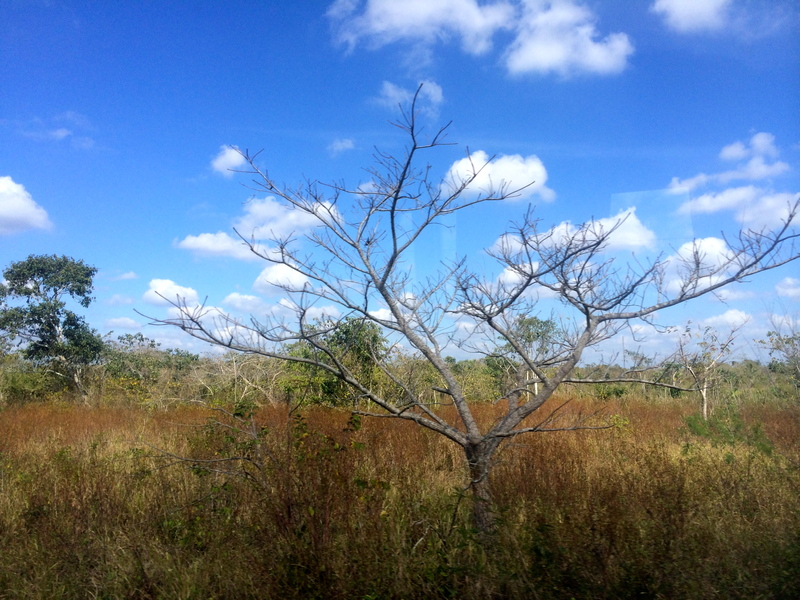 Typical landscape of the Yucatan Peninsula. Looks like Africa. The bus dropped us off at the main entrance to Chichen Itza, a UNESCO world heritage site and a recently voted New Wonder of the World. After paying the $17 USD entrance fee, we were approached by 2 Canadian guys who asked if we wanted to split a guide. We said yes and just like that we were walking around Chichen Itza. The guided tour took about 3 hours and we saw everything open to the public, which is only 10% of the entire site—Chichen Itza is huuuugggeee. 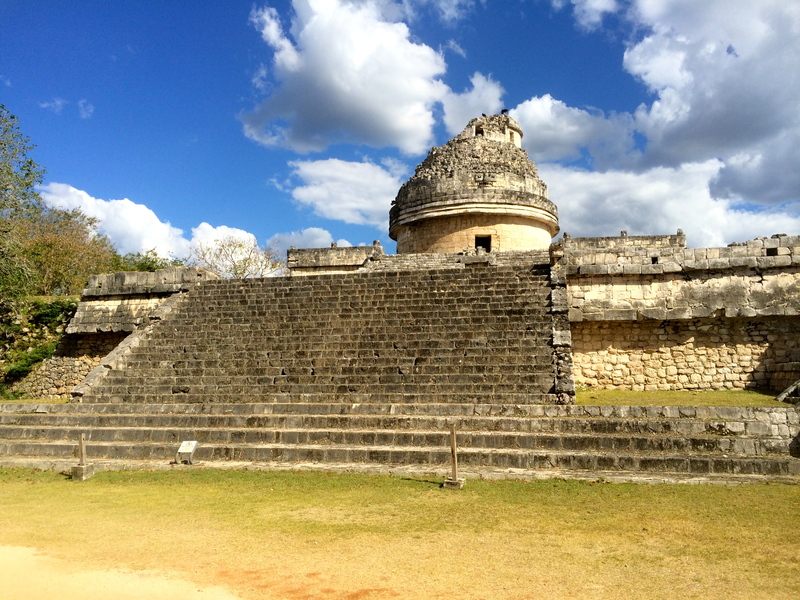 The Observatory where the Mayans observed the heavens and created their infamous calendar. Chichen Itza was not just a Mayan site, it was actually occupied by 3 different cultures. The first culture was called the Itza for which the site was named. 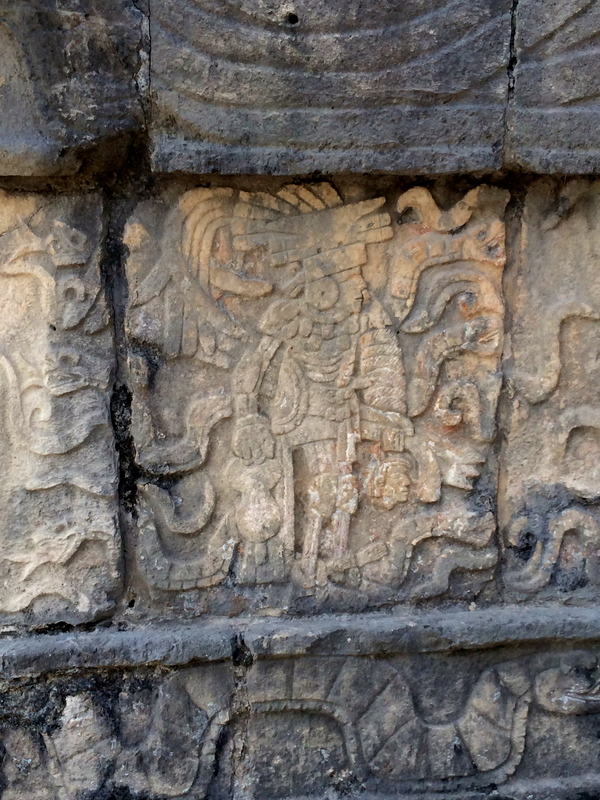 They were described by the Maya as too sexual and had many phallic symbols on their buildings. The second culture was the Maya which was relatively peaceful and very religious. The third culture was the warlike Toltecs. They increased the number of human sacrifices and conquered many of the Mayan cities (but didn’t destroy the Mayan civilization). While some of the buildings are Itza and Maya, the majority are Toltec. In fact, the main pyramid is Toltec but was build around an older Maya pyramid. 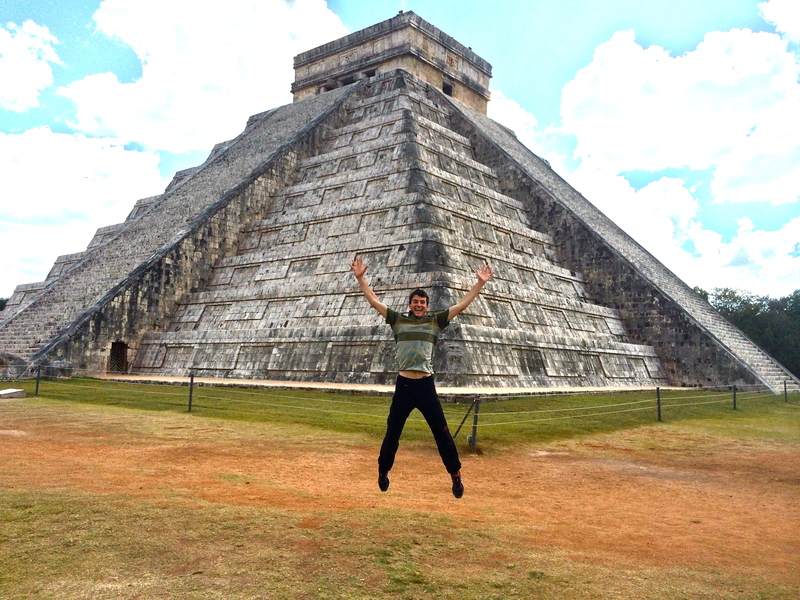 Yesterday I was in LA, today I’m at Chichen Itza! We started the tour with the main pyramid/temple called the Castillo. It was actually a Toltec pyramid built on top of an older Mayan pyramid. The main pyramid was dedicated to the powerful air god and the rain god. The pyramid had a number of cool features such as a snake of light appearing on the solstice and equinox and steps representing the months of the Mayan calendar year and . The feature that we tested out was the echo. If you clap at the east wall, a lightsaber-like sound reflects back. Human sacrifices, the most well-known Toltec custom were aplenty at Chichen Itza. We visited the warrior temple where they sacrificed their enemies to the gods by ripping out their hearts. The high priest would eat part of the heart and then chuck the rest of the body down the stairs. 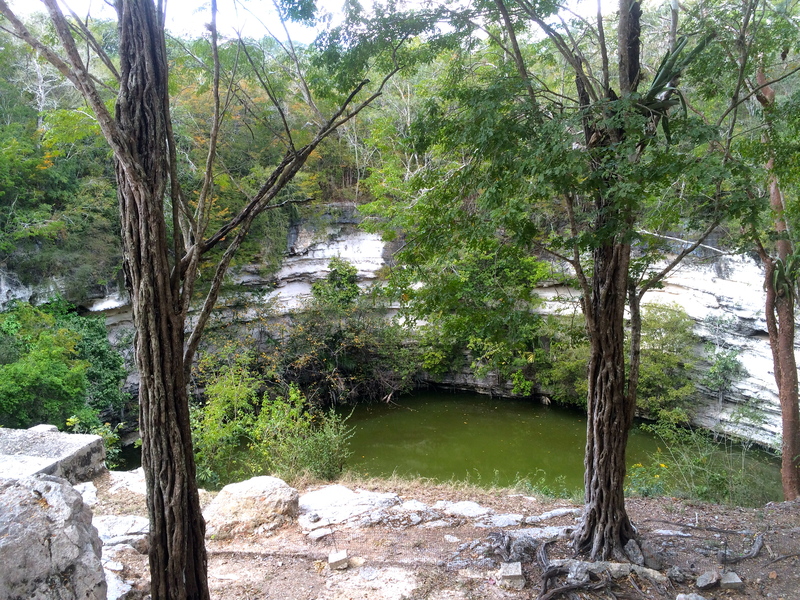 We then visited the sacred cenote, a large watery hole in the ground surrounded by steep limestone cliffs. Every few years during a drought, a child with curly hair would be thrown in the pit and would drown to be sacrificed to the rain god. When archeologists excavated the cenote, they found about 60 skeletons. Finally we saw the ball-court, the largest in the world. The goal of the ball game was to hit the ball into a hoop without using your hands or feet- elbows were mainly used. The rubber ball weighed 5 lbs. The hoop was very high above the ground so I have no idea how people were able to score. Anyways the game was played to 1 and the winning (surprisingly not the losing) team was sacrificed to the gods. 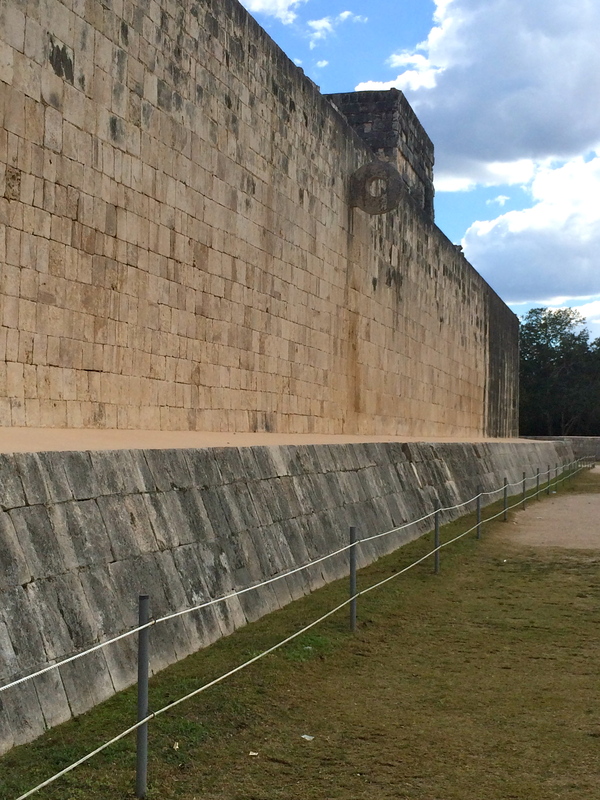 There were 15 ball courts in Chichen Itza so there were plenty of opportunities to practice the game and not get sacrificed- the big game happened every few months. In short, the sacrifices did happen but were fairly rare occurrences. The sacred cenote where the children would be sacrificed. After the tour, we walked out the back entrance right to our hotel. During the late afternoon, we looked unsuccessfully for an ATM, went for a quick run and planned the rest of the trip, as we had no plans after tonight. The tour guide mentioned some ruins call Uxmal which was about 3 hours to the west past the city of Merida. We decided to stay in Merida for 2 nights and go to the ruins for one day. Then on Friday we would take the bus back to Cancun, spend the night there before our flight on Saturday. The planned part of the trip was done, now it was time to improvise. Nice pool at the hotel. The statues definitely add to the ambiance.